Most people have seen a preview or know enough to guess they’re going to see a picture about a great racehorse named Seabiscuit. So why are we, 15 minutes into this movie, so puzzled? We’re watching black-and-white stills of early 1900s America, backed by a soothing narrative, film-reel style. The narrative launches into the Model T history and seems to be about cars, not horses. In this Depression-era history lesson and tale of how a successful bicycle-seller-turned-Buick dealer got his start, we’re starting to wonder: Where’s the horse? The horse and his entourage arrives on the scene eventually, but Seabiscuit is slow out of the gate and at 2 hours and 20 minutes often seems to plod predictably along. Whenever there’s a question about whether the quirky horse will succeed, he comes through – which means his trainer, rider, and owner all come through too. Spirit: Stallion of the Cimarron, an animated feature told from the horse's point of view. This is all very pleasant, but we’re still wondering why we’re getting to know our Buick dealership kingpin so well, especially now that he’s tragically lost his child to an accident and his wife is leaving him too. In the aftermath of his tragedy, Charles Howard (Jeff Bridges) trades his older, sadder wife for a newer, Parker Posey-lookalike model (Elizabeth Banks), sets aside his automotive enthusiasms, and turns his interest to horses. (Aha! That’s why we’re here!) He hires a “crackpot,” the homespun, horse-whispering mustang breaker, Tom Smith, played by Chris Cooper (Adaptation’s Oscar-winning orchid thief). Howard decides to let his mysterious new trainer rehabilitate Seabiscuit, who is sired from a great steed but who the racing world has written off as a cart horse. It is the odds against him that make the racehorse’s ascent to greatness thrilling. Howard says, “People say my horse is too small, my jockey is too big, my trainer is too old, and I’m too stupid to know the difference!” Seabiscuit is nowhere near the size of the other horses he’s racing, he’s given up for lame, he sleeps all day, and yet time and again he produces amazing bursts of speed on the track. While we get thrilling tastes of his racing prowess, we never get to know this horse very well. In a fond corner of my memories resides the skittish beast Kelly Reno tames in the Francis Ford Coppola film The Black Stallion. Sadly, Seabiscuit pales by comparison. In Coppola’s lyrical horse movie the horse is a spirited and vivid character throughout the film. We grasp his self-importance, the traumas that drive him. We see Seabiscuit, on the other hand, sleeping in his stall, parading by, or thundering down the track, breaking into a sprint time and again – but with no personality. Instead Director and screenwriter Gary Ross (writer of Pleasantville, cowriter of Big) gives us a couple of comical glimpses of a horse with a labored gait and then uses the other characters and a few races to tell us about the horse throughout the film. William H. Macy provides much-needed comic relief as one of those characters who tells us about Seabiscuit’s prowess, hammy radio announcer Tick-Tock McGlaughlin. The 1930s jockey’s hardscrabble life is the meat of the nonfiction book Seabiscuit, by Laura Hillenbrand, on which this film is based. Hillenbrand describes how Red Pollard (played in the film by Tobey Maguire) was likely to have spent his days and nights. All waking time was spent hungry and thirsty as riders slaved to keep themselves small enough to ride; the men abhorred food and water. Purging, exercising strenuously in high heat, and steam baths allowed them to shed up to 13 pounds from one weighing to the next. Jockeys routinely collapsed, on and off horses. The brutality of a jockey’s life is the compelling texture of Hillenbrand’s book, which sometimes reads like excerpts from Dickens novels. Jockeys are routinely overworked, underpaid, uninsured, dehydrated, and undernourished. 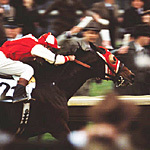 The scene in which Pollard has to fend off the sticks of the other jockeys on the track during a race does not exaggerate. In the movie as in the book, jockey Red Pollard (Tobey Maguire) is an oddity: a highly literate and angry young man who likes to recite stories and get pummeled in the boxing ring when he’s not riding. Maguire is no more charismatic than he ever has been, with reedy voice, buggy eyes, and very red hair, but he is comfortable enough with his animal companion, Seabiscuit. The film shows us a handful of people rehabilitating a lost cause of a horse, everyone decent, hardworking, and loyal. The Howards fund the trainer, the trainer works his whispering magic, the beleaguered rider works himself and his horse into championship shape to redeem them both, the owner drums up enough publicity to motivate everyone, and everything the little horse does reflects a warm glow on the people surrounding him. All the goopy goodness doled out in this film is a missed opportunity, given the book’s astonishing truths and the inevitable conflicts between owners and trainers, trainers and riders, and all of them and the horse himself, who often has his own ideas. Yet the movie backs off from conflict and only hints, for example, at the philosophical gulf between Charles Howard, who wants to give the people access to his famous little horse and trainer Tom Smith, who wants to give the horse the peace and quiet to work. The story and narrative is a representation of a Democrat’s Heaven, in which the 1929 stock market crash is a great leveler of men. The narration, illustrated with WPA photos, warmly describes the New Deal projects that made people useful for the first time since the crash. Seabiscuit is an underdog in a time when most of the population are themselves underdogs. This film cheers them on down the home stretch again and again. Seabiscuit is all about redemption. Race after race, comeback after comeback, a horse and his people recover from falls and accomplish great feats against great odds (often astonishing when horses are involved – see last year’s Belmont Stakes race for a goosepimpling example). Randy Newman’s score, sometimes bright and lively, too neatly predicts every triumph and makes each success a foregone conclusion. Next to the book’s amazing tales of oppression and strength despite all odds, the filmic version of Seabiscuit gallops around the track and rewards us with the sweet satisfaction of all ending well, yet lacks the staying power of its champion – or the book that inspired it.